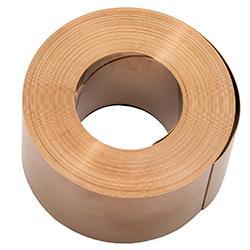 The NEG'ATOR constant torque spring motor is a prestressed strip of spring material which is formed into a coil and is stored on a small storage drum. The free end is then fastened and backwound onto a larger output drum; this is the "winding" portion of the constant torque spring's cycle. When the output drum is released, the spring will return to the storage drum to assume its natural curvature thus rotating the output drum and providing virtually constant torque. Hunter Spring constant torque springs are made of type 301 high-yield stainless steel and are supplied in coils for mounting on motor drums. We offer a wide range of standard constant torque springs. For further details, please click on our Standard Spring Design Guide for Constant Torque Springs. We also offer constant torque springs as custom spring solutions to suit your specific needs. Use the constant torque spring design worksheet to specify your requirements and allow our Application Engineers to provide you with a design to meet your needs.